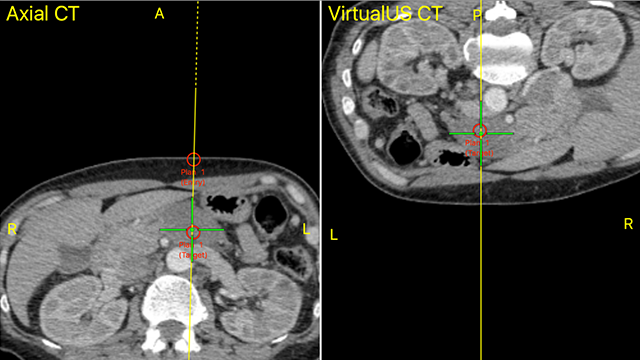 A 60 year-old female with a diagnosis of pancreatic adenocarcinoma presents for Veran 4D navigation guided fiducial marker placement required for accurate and effective treatment with SBRT. 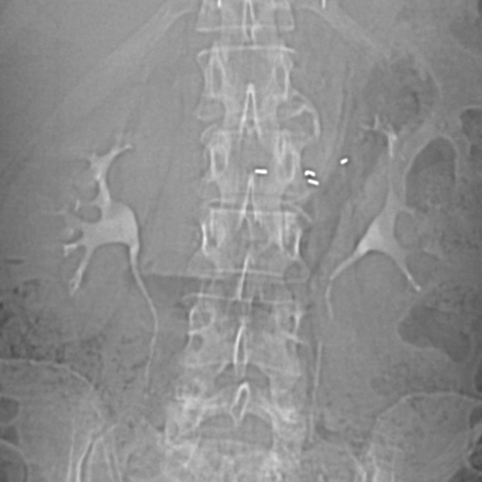 Patient was deemed not be a surgical candidate due to close proximity of the mass to the splenic vein. The patient had poor tolerance for chemotherapy with no significant decrease in size of the pancreatic mass on a post chemotherapy CT scan. Four distinct locations within the periphery of the pancreatic body and tail mass were identified for safe percutaneous fiducial marker placement. 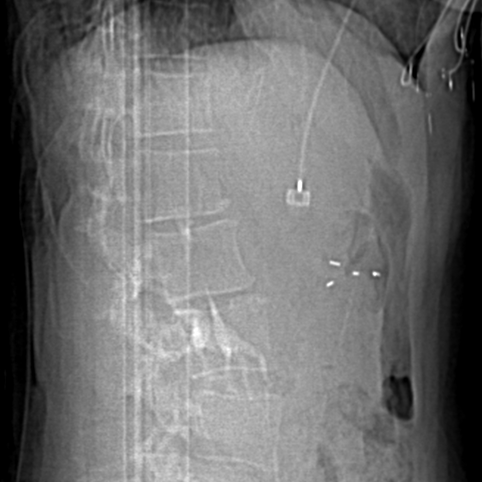 IV contrast was required on pre-procedure planning CT to help identify vascular structures in the peripancreatic mid abdomen. Using the SPiN IR™ software, needle trajectory was carefully reviewed and confirmed circumvention of these vessels. After informed and written consent was obtained, the patient was placed supine on the CT table. A vPad™ was then placed on the anterior left chest. A pre-procedure CT scan with IV contrast was obtained. IV Contrast was administered in order to identify and avoid vital peripancreatic vessels while accessing the targets in the periphery of the pancreas mass. The patient received IV sedation and the anterior abdomen was sterilely prepped and draped. The entry point was identified and 1% lidocaine was administered subcutaneously. A small skin nick was made at the entry site. Subsequently, using Veran’s SPiN Thoracic Navigation System™, a 19ga Always-On Tip Tracked® needle was then advanced between the left lobe of the liver and medial fundus of the stomach to the first of four targets within the pancreatic mass. A fiducial marker was then deployed. Using continued 4D navigation guidance, the Always-On Tip Tacked® needle was then angled to the other targets and fiducial markers were placed, obviating the need to traverse the liver and stomach again. After successful placement of all 4 fiducial markers within the periphery of the pancreatic mass, the needle was removed. 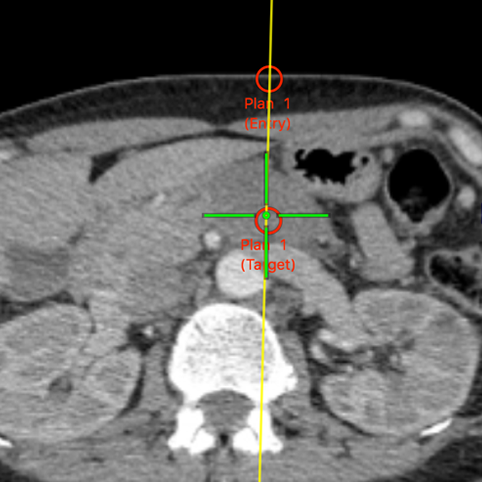 A post-procedure CT scan was then performed, confirming accurate placement of the markers at the target sites. The patient tolerated the procedure well with no evidence of post-procedure complication. The patient was scheduled for SBRT 10 days post fiducial marker placement.